Alice is an associate in the firm’s Tax & Business Planning and Real Estate Groups. Alice’s practice focuses on a broad range of federal tax issues, including relating to the representation of REITs and other publicly traded corporations. Prior to joining Barack Ferrazzano, she was a legal intern at a publicly traded international technology services corporation. During her time there, she assisted in the development of a corporate security takeover defense manual, as well as advised the Board in written memorandum of actions in challenged director decisions. Her work also included partnering with the tax department to research employment and corporate laws and to analyze tax incentives for relocating the company's IP holding company from Bermuda to Illinois. Prior to attending law school, she created and taught an AP English curriculum to urban youth and led a team of senior research project teachers for Teach for America, as well as interned at the United Nations Children's Fund in Beijing, China, where she researched, analyzed and presented international models of child protection and related laws to leaders of HIV/AIDS, Protection and Policy departments to assist in establishing a child welfare system. 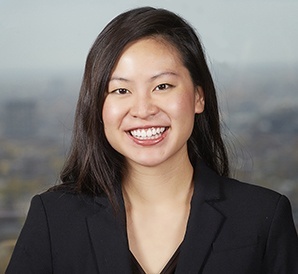 During the summer of 2014, Alice was a Public Interest Law Initiative graduate fellow at The Young Center for Immigrant Children's Rights and was sponsored by the Firm. Alice is fluent in Mandarin and has intermediate proficiency in Spanish. Representation of Anchor Bancorp, Inc. in connection with its sale to Old National Bancorp (Nasdaq: ONB). Represented USAmeriBancorp, Inc. (OTC Pink: USAB), in connection with its merger with Valley National Bancorp (NYSE: VLY). Valley National Bancorp Completes Its Merger of USAmeriBancorp, Inc.